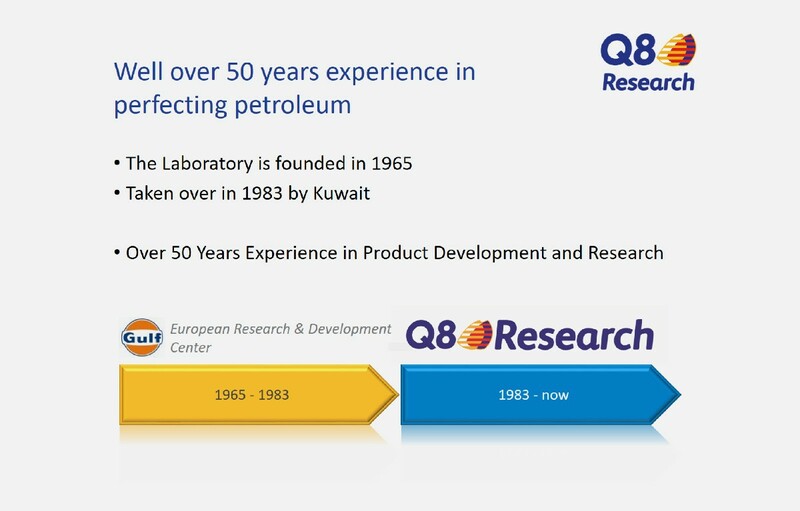 Q8Research is part of the Kuwait Petroleum Corporation (KPC), one of the world's largest oil companies. With 120 years of known reserves and crude oil production levels of 2.9 million barrels per day, it is ranked the seventh largest oil producer in the world. KPC's business spans every segment of the hydrocarbon industry: on and offshore exploration, production, refining, marketing, retailing, petrochemicals and marine transportation. 1965: Opened as satellite lab of Gulf research. 1983: Acquisition by Kuwait Petroleum International. 1985: First Q8 branded product line. 1987: Start Catalyst research program. 1989: Training staff for MAB refinery expansion. 1990: One of first in market with group III base stock (UBO). 1994: ISO Dewaxing catalyst research. 1999: Quality assurance of refinery. 2005: Extended bitumen application for noise damping of cars. 2006: Q8Formula V long life. First fill with VW. 2008: Supported the introduction of Euro4 gasoline in Kuwait. 2011: REACH completing ALL H&S registration dossiers completed. 2014: Gas Engines New generation of gas engine oils introduced. 2015: Bitumen productions from KEC. 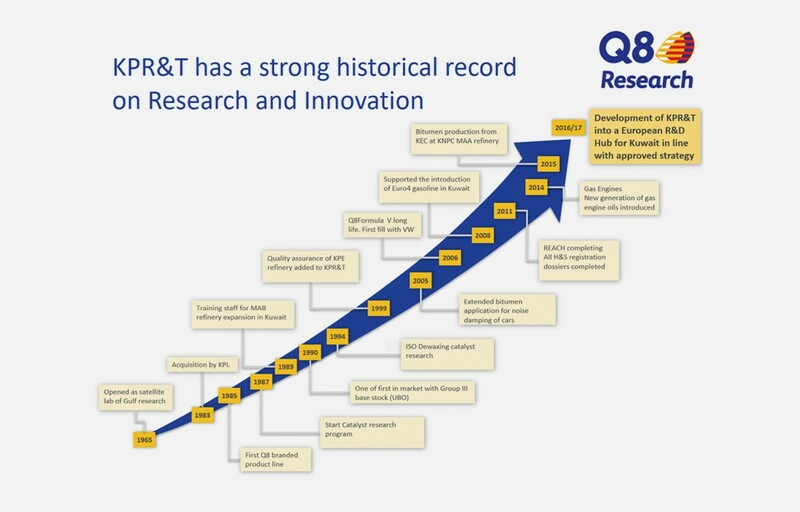 2016/17: Development of KPR&T into a European R&D Hub for Kuwait. Kuwait Petroleum Research & Technology B.V.